In 1868, life for the townspeople of Ogden begins to change rapidly when the railways expand to the Utah Territory. 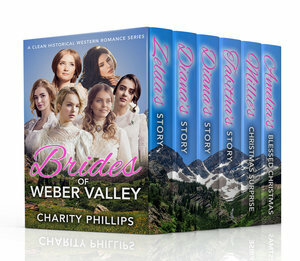 Follow the struggles and triumphs as new opportunities–and the chance for true love–arise for the young ladies from the Hughes and Cooke families in the Brides Of Weber Valley series! Zelda, the eldest daughter of the Hughes family, longs for a life away from the rolling hills and barn animals of her parents’ farm in Ogden. She loves and supports her family but longs to explore what else the world might have to offer her. When word gets around that there is a railway expansion planned to be constructed nearby, Zelda is excited for the new opportunities–and people–it might bring. One day while running errands, Diana Cooke meets a striking young man named Aaron Pratt. She learns that he comes from a proud line of farmers, but is currently facing challenge after challenge at his family’s dairy farm. His father is bedridden from a terrible injury, leaving Aaron to take on all of the daily tasks to keep their livelihood afloat. Her heart goes out to him and his plight and they become fast friends. She finds herself thinking of Aaron every day and longs to help him and his family overcome their hardships. Hattie Hughes works hard as the assistant innkeeper to her sister-in-law, Diana’s, prosperous business and finds herself longing for a husband of her own. One day, along comes a handsome, mysterious traveler who needs a room for a more long-term basis as his train is delayed by the snow. This stranger, Matthew Ford, turns out to be kind and understanding towards Hattie, offering a friendship she never realized she needed. With her younger sister, Suzy, Tabitha Church fled her home in Chicago one autumn night, running away from an engagement that was doomed to become a loveless marriage if she didn’t do something about it. They arrived in the small town of Ogden, Utah with nothing but the dresses on their backs and a fair amount of hopefulness. Millie Saxton knows what she wants. Or, more accurately, she knows what she doesn’t want. She left New York, the place of her birth and her successful job as a seamstress at a shirtwaist factory, to find love out West. She met a man named James O’Neill who placed an advertisement in the newspaper and, before long, sent for her. But when the train stops in Ogden, Utah and a nasty winter storm hits, Millie finds that her future as Mr. O’Neill’s bride might not be what she wants after all. A recent widow, young Amelia Hawkins leaves behind her life of bereavement and bad memories to travel west to live with Mr. Percy Andrews, a friendly and caring general store owner who is well-liked by everyone in the town of Ogden. From their very first meeting at the railway station, she is taken by his kindness and gentle nature and knows that God has blessed her with a second chance at happiness.